Fatah has said it will scrap its deals with Israel over the latter’s “continuous aggression” in the occupied West Bank. Member of Fatah’s Central Committee, Mohammad Ishtea, said that “all the deals with Israel were violated; therefore, we will not respect them,” Anadolu Agency reported yesterday, citing official Palestinian news agency Wafa. “The relations with Israel are currently frozen and the findings of the Palestinian leadership’s meetings in the coming few days will draw the lines for the relationship [with Israel] in the future,” Ishtea added. The senior Fatah leader stressed that the issue of security cooperation with Israel is currently on the table, due to the “latest Israeli aggression” in Ramallah last week. On Thursday, member of Palestine Liberation Organisation (PLO) Executive Committee, Ahmad Majdalani, revealed that the Palestinian leadership is to meet today to discuss the latest political in the occupied West Bank. For about a week, the West Bank has been witnessing increased tensions and violence due to Israel’s campaign of arrests against Palestinians, as well as the PA’s crackdown against women who took to the streets in protest. The Government Media Office (GMO) in Gaza has called for journalist syndicates in the Arab world to “take clear disciplinary action” against those members who visited Israel. The issue is dangerous because the visit came at a time when the Israeli occupation is increasing its violations against Palestinian journalists, a few months after the decision of the Union of Arab Journalists to criminalise media normalisation. Last week, a group of Arab journalists visited the Israeli Knesset and met Jewish MKs, as well as a number of other Israeli officials. The journalists – who work in France and Belgium but hail from Egypt, Lebanon, Algeria and Morocco – asked questions regarding Israel’s ongoing occupation of Palestinian territories and its controversial Nation State law passed earlier this year. Israel’s siege and Palestinian Authority (PA) sanctions on the Gaza Strip have widened the economic gap between it and the occupied West Bank. The siege and the PA sanctions, including the cessation of new government recruitment and halting [government] spending in Gaza, led to a wide economic gap between Gaza and the West Bank. While Rajab did not deny there is an economic crisis in the occupied West Bank, he said the situation there “is better than Gaza because of the continuous government recruitment carrying out development programmes, as well as the opportunities for West Bank residents to work in Israel”. Recently, the Palestinian Central Bureau of Statistics revealed that 35 per cent of Palestinian families in Gaza had completely or partially lost their income in the past 12 months, compared to only 6 per cent in the West Bank. The bureau also found that 54 per cent of families in Gaza had no access to running water and 51 per cent were unable to pay for water treatment, compared to 10 per cent in the occupied West Bank. In addition, 31 per cent of Gaza’s residents were unable to receive healthcare services due to shortages of medicines and medical equipment, compared to only 7 per cent in the West Bank. Specialist Amin Abu-Aisha said that Israel’s siege and PA sanctions reduced the real growth rates in Gaza to 0.5 per cent in 2017 and -1.5 per cent this year, compared to 3.5 per cent in the West Bank. Head of the Representative Office of the People’s Republic of China to the Palestinian Authority (PA), Guo Wei, said of the announcement that: “China attributes great importance to the vital role that UNRWA plays in alleviating the humanitarian situation of the Palestine refugees.” “[China] appreciates the work done by UNRWA in the areas of health, education, and other basic services, and that is the reason why the Chinese government has made additional contributions worth two million dollars to UNRWA this year,” he added. China has always been a strong supporter of UNRWA, and this year it has provided additional assistance to UNRWA’s emergency food programme in Gaza, at a time when the Agency faced a critical funding deficit. China remains an important and valuable donor to UNRWA, and I would like to extend to them my sincere thanks for their sustained commitment to the Agency and Palestine’s refugees. Though China has long been a supporter of UNRWA, the donations it provided to the agency this year have significantly increased compared to previous years. This comes in the wake of significant shortages in UNRWA funding after US President Donald Trump announced earlier this year that he would cease all US support for the agency, leading China to increase its funding to an unprecedented level. We have all faced turmoil in our lives. We are tested. We all have to be tested. If you were to list all the major catastrophes that you have encountered in your life, what have you lost? Why are you unhappy? Are you being ungrateful for all the blessings that you have? The Tābi‘ūn (Followers) are the generation of Muslims who were born after the death of the Prophet Muhammad PBUH, but who were contemporaries of the Sahaba (Companions of the Prophet PBUH). Let’s look at the life of an important follower. The follower is a great lady. She was tested throughout her life, with the harshest of tribulations. Her grandfather is Prophet Muhammad PBUH. She is Sayeda Zaynab bint Ali. She is the sister of Al Hassan and Al Hussein PBU them. All the disasters in her life were tests. The more she was tested, the more she gave and contributed to society. We all have to go through ordeals, trials and tribulations in our lives. That is life, it is a series of tests. The greater the trial, the greater the reward. We are tried by blessings, as well as by tribulations in our lives. There is not a single person who is immune from life’s troubles. It is those who have strong faith in God that will never lose hope and will always have the strength to carry on. Prophet Muhammad PBUH lost several of his children in his lifetime; he lost 3 of his daughters in 2 years. The Prophet was especially compassionate towards children. When facing tribulations, you have to be patient and steadfast in your faith. If you feel defeated or depressed, use your faith to stand back on your feet. God is hope. If you lose hope, you will go down a spiral of desperation with serious consequences. There is hope, keep the hope alive, use it to empower yourself and others into thinking positively and taking positive action. The path of desperation is littered with sadness and self loathing. These are destructive feelings that can lead to very sad endings. Be resolute and determined to defy all odds. Be the positive light in peoples’ lives – Muslims and non Muslims. Raise your children to see you as caring and revering. Be gentle and loving, follow the example of the Prophet PBUH in treating your spouse, your family and all those around you (Muslims and non Muslims) with kindness, fairness and respect. To fulfill her mother’s will, Sayeda Zaynab PBUH – who was still a child, found herself responsible for her older brothers, her father and the entire Ummah. When she was 10 years old, she used to invite the poor and cook for them. She became the founding pioneer of voluntary and charity work. The first Muslim care home was established by Sayeda Zaynab PBUH. She was the first Muslim to establish an orphanage. Her father, the great Caliph Ali PBUH, would always seek to consult her. While she was young, she helped shape her father’s historic decisions that affected the history of the Islamic empire. She also influenced her brother Al Hassan’s critical decisions in the hard times that ensued. Do you consult your mother? Your wife? Your sister? Your daughter? Do you follow the role models of Islam in revering the women in your life? If you don’t, you are guilty of breaching the high standards of respect for women required by Islam. There are some Muslims who oppose paid work and voluntary work for women. How can they challenge the role of women in Islam? How can they ignore the example of the great women in Islam, who not only contributed to voluntary work, but were at its forefront as pioneers? Women in Islam work and contribute in every field of human endeavour from business and science to voluntary work. Caliph Ali PBUH and his son Al Hassan PBUH not only valued Sayeda Zaynab’s PBUH opinions wholeheartedly; they also supported her in her voluntary work. She was able to expand her voluntary work and opened another branch for her establishment in Kouffa. Her husband financed her work. She lost her father, her son and her 2 brothers; she returned to Medina and was forced to leave Medina in the political turbulence that ensued. After going through all this, she established another care home for the elderly in Egypt. Her answer to the ordeals in her life was to give more compassion, love and care to others. Can you try to be as patient and strong as she was? Can you try to be a force of goodness and compassion as she was? This article is adapted from Dr. Amr Khaled’s lecture, he is an Egyptian televangelist. His work influenced Arab youth and has contributed to the calls for change in the Middle East. Amr Khaled is an Egyptian televangelist. His work influenced Arab youth and has contributed to the calls for change in the Middle East. He was voted as one of the most influential people in the world by Times Magazine. 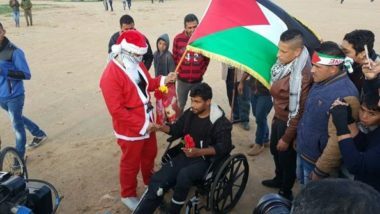 Palestinian Christians in the Gaza Strip have charged Israeli occupation authorities with issuing Christmas travel permits to some family members but not others. “Last year, 300 permits were given to the Christians in Gaza to celebrate Christmas in Bethlehem, but only to people over the age of 55,” said Fr Mario da Silva, Parish Priest of Gaza, speaking to Independent Catholic News. Israel is using a policy of separation between parents and children. It gives a permit to the father but deprives the mother and the children of the same document. Thus, the family decides not to go and stay together in Gaza. Although the demonstrators gathered in areas open to the Israeli snipers stationed on the top of the sand berms and military watchtowers and inside and behind the military jeeps, the Israeli forces fired live and rubber bullets in addition to a barrage of teargas canisters. 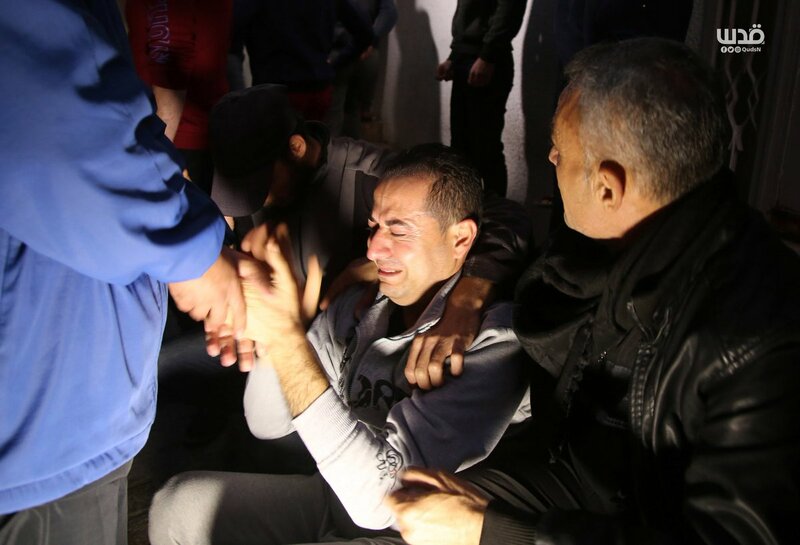 The Israeli shooting, which continued at around 17:00, resulted in the killing of 3 civilians, including a child and a person with a mobility impairment. Mohammed Mo’in Khalil Jahjouh (16), from Shati’ Refugee camp, west of Gaza City, after being hit with a bullet to the neck in eastern Gaza. ‘Abdel ‘Aziz Ibrahim ‘Abdel ‘Aziz Abu Sharia (28), from Gaza City, who was hit with a bullet to the abdomen in eastern Gaza and succumbed to his wounds hours later. Maher ‘Atiyah Mohammed Yasin (40), from al-Nussairat refugee camp, who succumbed to wounds he sustained after being hit with a bullet to the head in eastern al-Bureij refugee camp, noting that he had suffered a mobility impairment since childhood. Moreover, 115 civilians, including 21 child, 2 women, 2 journalists and 3 paramedics, were wounded. In addition, hundreds suffered tear gas inhalation and seizures due to tear gas canisters that were fired by the Israeli forces from the military jeeps and riffles in the eastern Gaza Strip. The commander of the Israeli army in the occupied West Bank, General Eran Niv, has reportedly tightened the rules of opening fire, for Israeli forces, on Friday, after a Palestinian teen was shot and killed near Ramallah, late Thursday. 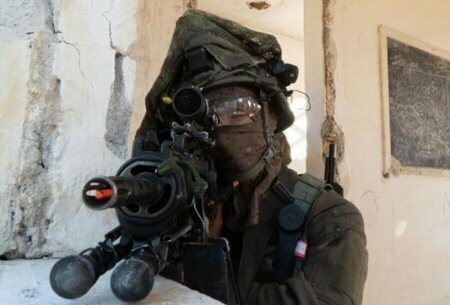 According to Israeli new outlets, Niv entitled the soldiers to only open fire in life-threatening cases, Ma’an reports. Israeli soldiers had opened fire at and killed 17-year-old Qassem al-Abbasi, after the driver of the vehicle he was riding in, with his friends, lost they way near the Beit El checkpoint, north of al-Bireh City, in the central occupied West Bank. 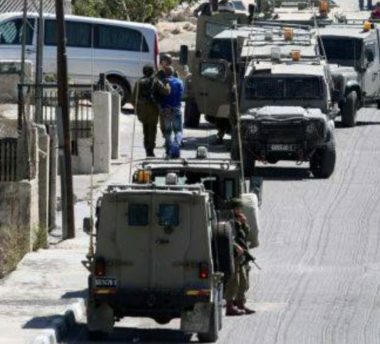 Israeli soldiers abducted, on Saturday at dawn and on Friday at night, two young Palestinian men from Jenin refugee camp, in the northern West Bank governorate of Jenin. Media sources in Jenin said the soldiers abducted Baha’ Mohammad Abu al-Haija, after summoning him to Salem military and security base for interrogation. It is worth mentioning that the soldiers invaded Baha’s home, two days ago, and ransacked the property, but he was not there, and the army handed the summoning order for his father, instructing Baha’ to head to Salem base, Saturday. On Friday at night, the soldiers abducted a young man, identified as Mojahed Khaled al-Hamdi, from Jenin refugee camp, after stopping his near the bypass road, close to the al-Jalama military crossing, north of Jenin. Three people, including a teenage boy, have been killed by Israel’s occupation forces during the Great Return March on Friday December 21st. 130 people have been injured up to 40 people have been wounded with live bullets. MOHAMMED JAHJOUH 16-year-old Mohammad Mo’een Khalil Jahjouh was fatally shot east of the Gaza City. Early reports said that Mohammed was shot in neck and blood can be seen under his chin in a photograph taken as he was carried on a stretcher, but a later photograph in which an attempt to resuscitate him is being made in hospital doesn’t show any apparent evidence of a neck wound. Jahjouh’s death was announced soon after 16:00 pm local Palestine time. He is 56th minor killed this year by Israeli occupation. MAHER YASSIN 40-year-old Maher Attia Yassin was shot in head east of al-Bureij refugee camp and survived several hours after having been shot before succumbing to his wounds. Yassin was an inhabitant of the Nuseirat refugee camp. His death was announced around 19:30 pm Palestine time. It is unconfirmed whether Yassin is the ‘youth’ news agencies tweets reported as shot in head while he was entering a bus as demonstrators were already departing from the border with ethnically cleansed Palestine 1948. According to our count Maher Yassin is 304th Palestinian killed this year by Israel and 250th person killed during the Great Return March. 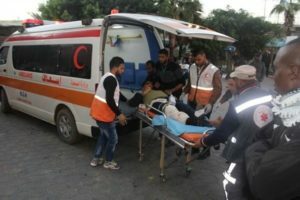 ABDUL-AZIZ IBRAHIM ABU SHARIATA 28-year-old Abdul-Aziz Ibrahim Abu Shariata from the Al-Sabra neighborhood was wounded east of Gaza City. His death was announced late in the evening, about 22:00 pm and currently very little is known about his case. JOURNALISTS, AMBULANCE TARGETED Among the up to 40 people wounded with live ammunition are 4 paramedics and 2 journalists. Of the latter Sami Musran was shot in his foot with a live bullet. Another journalist, Mohammed Moheisen, escaped possible serious injury as a bullet stopped in and destroyed his camera. An ambulance was hit by a tear gas grenade, which was captured on video as it spread tear gas inside the vehicle as people tried to retrieve it from the vehicle.